Peter Mclennan believes that the more we can educate people on the importance of backflow prevention, the better. Not a day goes by when I don’t have to explain what a backflow preventer is and how it works to prevent the contamination of the drinking water supply. The plumbing fraternity understand plenty of others are ignorant to the consequences of a cross connection. Many of us have seen the photographs of blood from an abattoir being flushed from the water mains after a cross connection incident but in all honesty, incidents like these are rare and either hushed up or not made public. If the public was aware that things like this happened, they would become more aware of their actions. Worldwide, the greatest number of cross connections is created by a hose connected to a standard water tap. This alone is just cause to mandate the use of hose connection vacuum breakers on each and every external hose tap. It’s a small cost but one that provides a huge level of protection. I read an article in a respected Australian trade journal recently which reviewed backflow prevention devices and cited Australian cases. Great I thought, a bit of a profile boost for the humble backflow preventer and another opportunity to raise the awareness and educate the reader. But as I read on I discovered the article was about flap gates and non-return valves used in stormwater systems to prevent backup of water in flooding and storm situations – not backflow prevention devices at all. The writer obviously knows his industry, but is misguided in what a backflow preventer is and what the differences are between these types of products. Backflow prevention devices are mechanical devices which meet a stringent Australian Standard where the materials of manufacture and the performance are audited so that the product can attain the WaterMark certification. They are a safety device for use in the potable water supply to prevent backflow where the potential exists. AS/NZS 2845.1-2010 is the applicable standard and flap gates and non-return valves do not meet this standard; therefore they cannot be called backflow prevention devices. It is situations like this that show the clear requirement for a greater level of education at all levels of what backflow is and ways to protect from it. 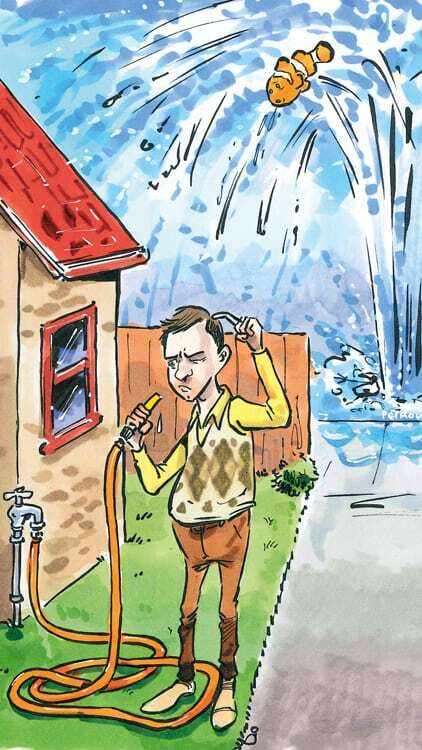 Some water authorities across Australia have publications designed to be easily read and understood by the home owner or business proprietor on possible causes of cross connections and what the responsibilities and penalties are so that there is no contravention of the local backflow policy. This is not consistent across the nation unfortunately. There are even some levels of government, where in their naivety, don’t believe in the need for backflow prevention. Resources are widely available for the water supplier that can assist in helping them develop a backflow prevention policy and for development of publications that can explain (in simple English) the risks and causes of cross connections in their water supply. The American Backflow Prevention Association even publishes a comic book called Buster Backflow, as a resource for schools to explain to children how backflow happens and how it can be prevented. See www.abpa.org/?page=BusterBackflow. Here in Australia, the Backflow Prevention Association of Australia Inc. provides educational programs, technical assistance and public awareness in the field of backflow prevention to all aspects of the water industry including consumers, governments, industry, mining and irrigation. As part of this education process the 2014 National Backflow Prevention Conference is being held in Melbourne on August 1-2. Speakers from all around Australia plus USA and New Zealand will cover topics relating to Standards, regulations and industry issues over the two days. If you are in the water supply industry, you should attend so that you can be brought up to date. Only through education at all levels will we get to the position where our understanding of the consequences of a backflow incident through a cross connection or a potential cross connection will illicit an informed decision on the actual risk involved.